Well, unfortunately my previous series is a bit derailed. I started working on an all new MongoDB driver and I hated to write up a whole series of post using a driver I didn’t really believe in. So, for those of you reading and waiting on that, please be patient with me – it’s coming, but I just want to wait until we have the new bits ready. That being said, one thing I used to do with my blog was do semi-regular code drops of things I found useful and perhaps to you too. That being said, I present a very basic code drop for doing tag extraction. One of the scenarios we were discussing was the ability to take a body of content and suggest possible tags for the post. Not terribly complicated, but I also thought it was a fun little routine to build. And, hell, if it saves you 30 minutes at some point in the future then it’s done it’s job. Take a look at the code, but it’s pretty simple. It strips all the HTML from the given input, scrubs out any punctuation that will cause problems, and then runs through all non-noise words and counts the occurrence of them in the string. I had been hearing all of this talk of the NoSql movement, and, being the ever-curious tech type, I had to dig in and see what it was all about. Of all the various options out there, MongoDB has been getting a lot of press lately. MongoDB is hailed as one of the top NoSql options out there for being ultra-scalable, and highly performant. You can see the long list of known production deployments out there. 1.) First, check out the Quickstart to get everything installed and setup. One note here: if you’re like me and you want to setup MongoDB to run as a service, check out the help in “mongod –h” but you can basically run “mongod –-install” and it will install it as a service for you. 3.) Unzip, copy where you need to and add it as a reference to your project. You’re all set! Your next step is to figure out how to work with MongoDB, and, as with any database (relational or not) you still have the basic operations: querying, updating, inserting and deleting. This assumes the default host (localhost), and port (27017; unless you configured it differently when setting up mongod). If so, there are constructor overloads to pass in a different host name and port. 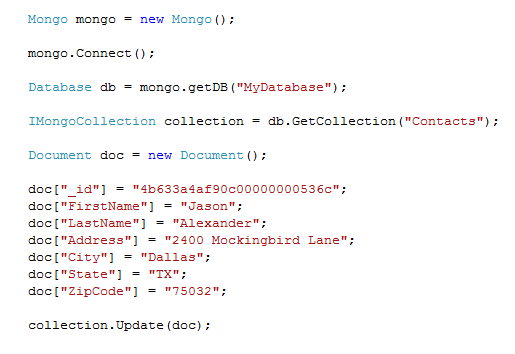 Because MongoDB is “schema-free” those documents structure can vary, even when in the same collection. Yes, hard to twist your brain around, but this is really just a logical grouping of data. In most cases, however, people do put like structured documents into the same collections. In this case, we’re getting a collection called “Contacts”. Even if you’ve never saved anything into that collection, yet, it will still return you a valid collection to work with. So, this is how you create new collections. Now that we have a collection, we can actually do stuff with it! Exciting, huh? Introducing the Document: end all, be all. 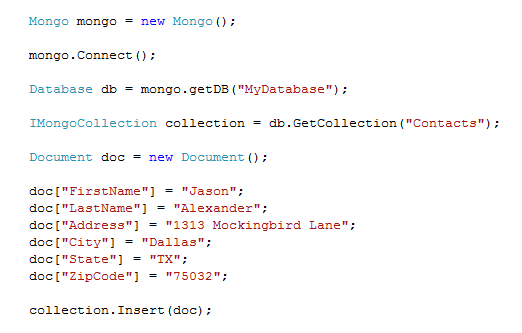 In the MongoDB world, the Document class is the center of it’s universe. Because the very concept of the database is built upon the concept of this document, this is what you’ll find yourself using most. You use them to insert data, update data, delete data, query data. You will learn to live it, love it and adore the Document. Here’s where I’m going to pick up the pace a bit because this is really where I got that “Ah ha!” moment, and I think you will to. Here, I did all the stuff from earlier (connecting, grabbing the database, getting the collection), and then I new’ed up a Document object. The Document object is nothing but a big Dictionary object, in this case. So, I go to town. As you can see, I create a logical entity for a “Contact” in my mind, adding first name, last name, address, city, state and zip code, and I assign values respectively during the process. Finally, I call the Insert method on my collection, passing in my document. Easy! The only difference here (and what I didn’t show) is that I added the “_id” property of my document, after having inserted it earlier. This gives MongoDB reference on which document to update. Here, I create a Document object, I set the “City” property to “Dallas”, and I call Find(), passing in that Document object. 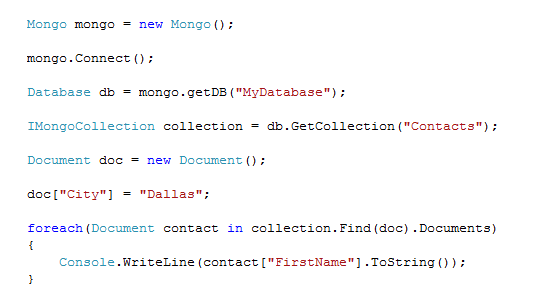 The Document object, in this context, acts as the query to MongoDB to tell it what to search for. From there, I iterate through Find().Documents, which is just a collection of Documents and print out the “FirstName” from each record. Whew, that was long, sorry. And, there’s still a ton more to cover, but I’ll leave that for another date. Interesting, eh? It’s been enough to make me think about using it in a project myself. What about you? UPDATE: Miguel pinged me on twitter to tell me that NDesk.Options is now Mono.Options and is now in the standard build of Mono. Awesome! I was working on my MDD framework, writing a command line application to help. Every time I do this I have to fumble around with how I’m going to handle the argument parsing. Typically, I end up just hacking something up so that it’s good enough, but this time I wanted to do it right. This is a great little utility class that parses the incoming string array. 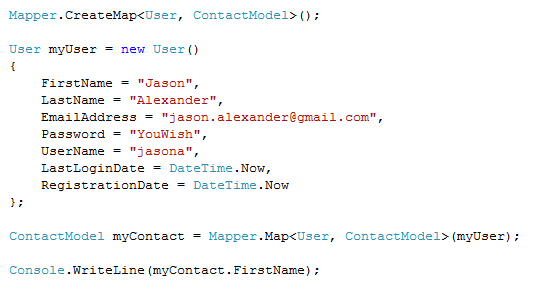 The awesome thing here is that it gives you a very flexible interface for defining the expected incoming parameters. You can add an option string that allows pipe delimited aliases, Boolean parameters (they’re there or not), and required or optional parameters. Here you can see it all. After newing up the OptionSet class, we start adding options. They have strict typed Option you can use, or you can do what I did, where I’m doing pipe (|) delimited aliases, with lambda expressions as the second parameter to actually do something with the value incoming. In my case, I’m using “=” which tells OptionSet that the parameter is required. If I wanted them to be optional, I would simply use a “:” instead. In the third option I’m not using either, which makes it a Boolean parameter. 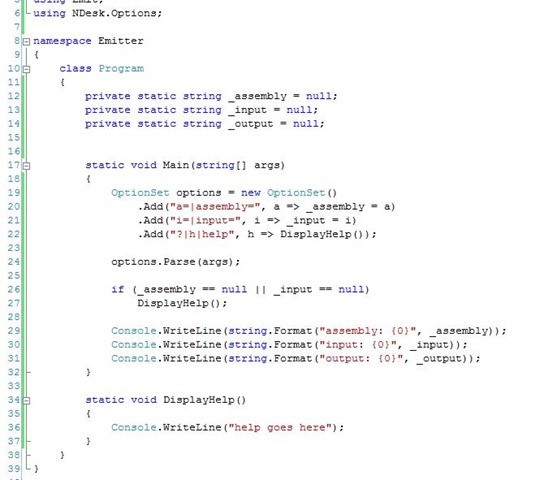 Here, I’m telling the OptionSet that if “?”, “h” and “help” is passed in to call the DisplayHelp() method below. And, there you go! Simple, but effective command line parsing. And, you don’t have to hack something together anymore every time. Every time I jack with my blog, I get lots of emails about my Authorize.Net C# API not being available any longer. It was one of the first ones that was ever written out there, and it’s been tried and true for many years. It doesn’t do everything possible that Authorize.Net offers, but it does all the basic commerce transactions necessary for building e-commerce (this was used on the original Telligent store). Added to my list is to one day go back and write tests for it so it has more testing and documentation built in. Meanwhile, take it FWIW. My reader count dropped off drastically. So, for those of you that are still there: THANK YOU! I promise more good content now going forward. I’m getting back to the point where my technical skills are where they were 3 years ago, and I’m starting to work on lots of fun side projects. With that, I want to share my knowledge in a way that I can’t on Twitter. I have a Google App Engine (GAE) product that I started building and will launch this year. This will play with Twitter, and will play on the power of crowd sourced knowledge. I’m going to start building some fun stuff on Azure. I can’t really talk about it yet, but I’ll definitely share my experience here. I’m going to write at LEAST one game for the XBox 360 using XNA. I have a great game idea already, and start studying up. I’m not naive enough to think I can make a living from this, so it’ll be for fun and NOT profit. I started working on a Model Driven Development framework. There are a few things out there that are similar, but in FubuMVC fashion, I’m going to build something for me by me, and if anyone’s interested in using it, great. So, all and all it’s good to be back – it’s been nearly 6 years now with my past work at Telligent combined with the last year of working outside the Tellisphere and getting my technical chops back.